In need of a relaxing vacation? Try our guest home on the Big Island. We are happy to invite you to our beautiful and secluded home with breathtaking ocean view. 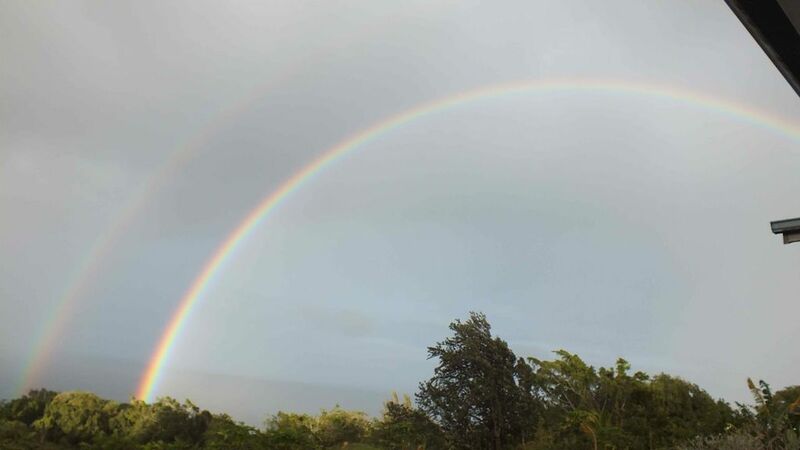 The guest home has a great lanai to sit for hours looking at an unobstructed view of the ocean, whales in the winter, and occasionally double rainbows. It is nestled about 500-feet above sea level on the slopes of Mauna Kea, the magnificent 13,796-foot mountain that in the winter is actually snow-capped. Laupahoehoe Point is a mile down the road from the house... one of the most beautiful miles you will ever walk or drive... vistas of green cliffs, often with waterfalls dropping to the blue-green ocean. When you get to the Point, there is some of the most spectacular rugged coastline you will ever see. dryer. There are two bedrooms, one bedroom with one queen size bed and the other bedroom with one full size bed, with additional futons if needed. * 'What a treasure you have here. We thoroughly enjoyed ourselves - it was so relaxing and beautiful. Being a farm girl, I very much enjoyed the cows, horses, the wild pigs. The view is so spectacular that we don't really want to leave. When we visit the Big ISland again, we will definitely stay with you. 'Thanks you for the wonderful fruit and flowers'. Thank you again for your hospitality. * 'Thank you for letting us stay in your wonderful vacation home. We truly enjoyed our stay. Your home is very well stocked with everything we needed and then some. It's a lot more spacious than pictures can do it justice and it is very private. The ocean views were the best we had while staying on the Big Island. We hope to be back again sometime and we'll recommend your home to anyone we know traveling to the big island'. * 'Waking up here and eating papaya on the lanai to coming back after full days of fun was delightful! Better than we had hope for. Staying here, really made our vacation...' Holscher/Wolking Family (Minneapolis MN). beautiful place...' Ted and Karen Gardner, (Stevensville, MI). These are just some of our previous guest comments. You too will enjoy this beautiful vacation house at an affordable price!!! * Fully-equipped kitchen with washer and dryer. * Boogie boards, snorkel gear, and beach equipment are also available upon request. You will find our home in a tropical paradise setting with many beautiful plants and flowers. Fruit trees such as banana, papaya, orange, peach, and guava are right outside. Just sit with a Mai Tai or a glass of juice on the lanai and you will know Waipunalei is a tropical heaven. .
Great views, birds singing, frogs croaking, and the landscaping is phenomenal. Clean with extra sheets and blankets. The kitchen is small but certainly enough. A beautiful flower in the living room was a thoughtful detail. Well supplied and very clean. Instructions for playing music on the tv would be appreciated. Liked picking fruit. Never saw the pigs or whales from here. Local music at the nearby cafe was fun. Great oceanview, clean, all supplies and more. Very comfortable beds. We will be back next year and thankful for friendly owners! Two couples spent 4 nights there in Sept 2018. It is a beautiful location. Very private and quiet. We found it well-equipped for our needs and big enough to be comfortable. The washer/dryer was a real plus for us. Great communication and responsiveness from the owners. Thanks! We really enjoyed our stay here! The house was very clean and private in a garden-like setting. The views were amazing! Beautiful views and amazing rainbows. This property was perfect -- with all the comforts of home and a fully stocked kitchen and outdoor grill for families looking to cook their own meals. I wish I could share photos of the rainbows we had nearly every day of our stay. We picked lemons and nectarines right on the property. We saw baby pigs and horses. It's quiet and peaceful yet close to some amazing hikes. I would definitely recommend this home.